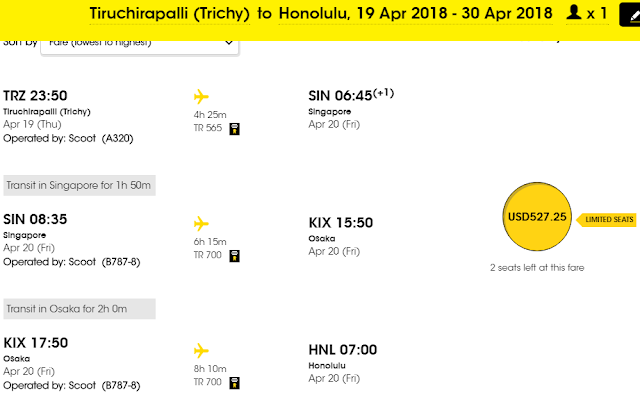 Singapore based budget airline Scoot has started flights to Honolulu, USA. Scoot is second Asian low cost carrier to fly to Honolulu after Air Asia. Just like Air Asia, Scoot also has opted to operate a one stop flight via Osaka, Japan. Both airlines take about 24 hours of flight duration with best possible connection, more if transit time is longer. In terms of pricing, Scoot is a bit expensive than Air Asia. The best return fare to Honolulu from Trichy that I have seen is about USD 1100+ or INR 72000. 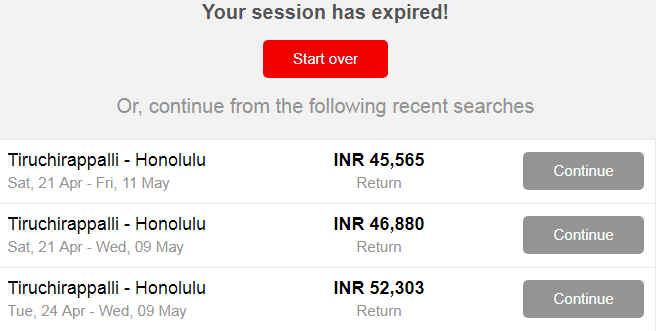 (without any add on like bags, meals etc) Under normal conditions, without any sale, if booked several months in advance and if you're flexible with dates, Air Asia can take you to Honolulu and back for about 45-50K INR. Baggage and meals another 10-15k extra. Total around 60k. This is not super cheap but decent enough if your main destination in Honolulu itself. (Next best option- reaching US mainland and then flying to Honolulu will cost you about INR 1 lakh at best rates, but if you're going all the way to Honolulu in all probability you'd like to visit US mainland also. Note that above fares are lowest. If you're particular about the date or if you're unlucky, ticket will cost twice as much for some of the dates. But does it make sense for Indians to go to Honolulu US for vacation or plan their US mainland visit via Honolulu? If beaches are your target, Mauritius, Seychelles, Maldives or Bali can be visited for one third the price. I've a detailed analysis in this earlier post. Quick answer is NO. But then, I don't think either Scoot or AirAsia is counting on Indian passengers to fill their flight to Honolulu. I feel Honolulu flight is targeted at customers in ASEAN countries who hitherto had to rely on Cathay Pacific or Singapore Airline to fly long distance to USA. So let us not complain much, just wait n watch. I think Mauritius is quite expensive when bookings made from India. An informative post that will help travelers decide and we need more budget air fares since the profile of Indian travelers are changing with middle classes becoming frequent flyers. It is reasonably cheap from Mumbai, BLR and Chennai (you can get return ticket for about 30-35k. of course not as cheap compared to what you can get on Air Asia or scoot. AirAsia had a flight to Mauritius but stopped.